It is beyond me why someone would honor architecture that celebrates the destruction of something that they held dear to at one point in history. 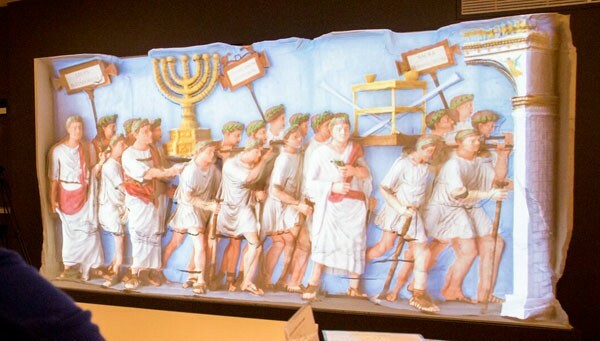 Recently there was a group of Jews that partnered with a company called Neathawk to make a replica of a panel that showed the Romans taking the spoils of the 2nd (Herods Temple) that is on the Arch of Titus that celebrates the destruction of Jerusalem. You can find their progression on making this panel from the Arch of Titus here (http://www.neathawkdesigns.com) and you can see a full color restoration here (https://www.biblicalarchaeology.org/daily/archaeology-today/cultural-heritage/true-colors-the-arch-of-titus/). The exhibit will be on display from September 14, 2017 to January 14th, 2018 and the link and article to the museum is below. The Arch of Titus, built to commemorate Roman triumph in the Jewish War of 66-74 CE, has stood as a touchstone of Western civilization for nearly 2000 years. This exhibition explores the shifting meaning and significance of this monument – for the victorious Romans, for the defeated Jews, and for both Christians and Jews over the subsequent millennia. 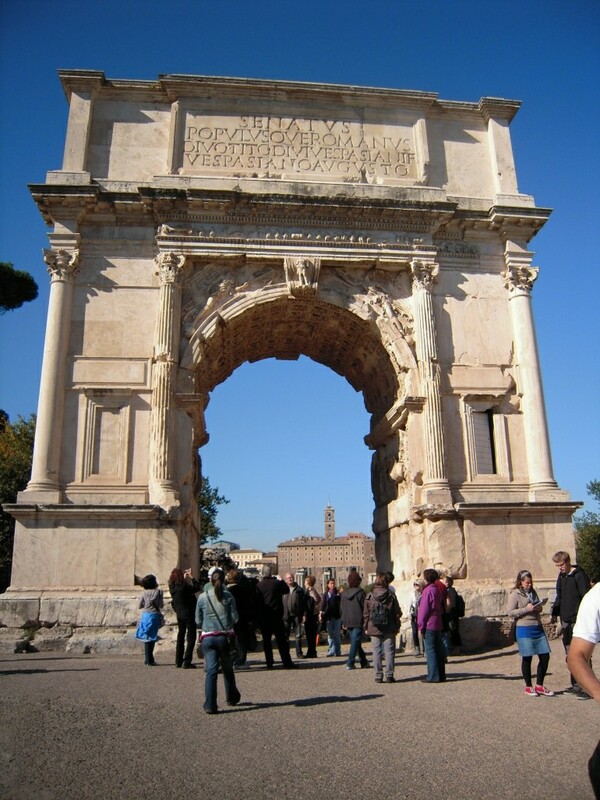 Built on Rome’s Via Sacra, the “Sacred Road,” around 82 CE, the Arch of Titus features sculptural reliefs depicting Titus’s triumphal procession into the Eternal City in July, 71 CE. 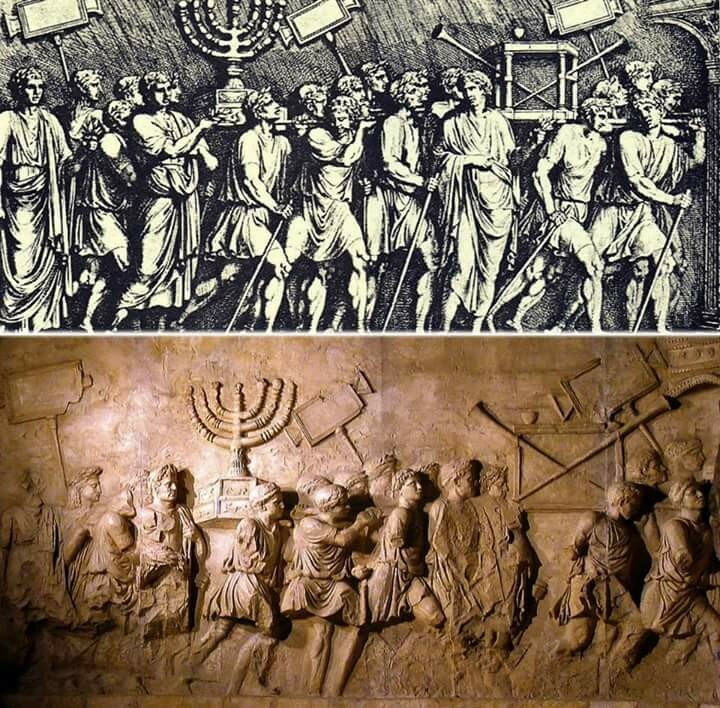 Painfully for Jews, the sacred vessels of the Jerusalem Temple are shown being carried into Rome by victorious Roman soldiers. At the center of the representation of the Spoils of Jerusalem is the seven-branched golden menorah, which, since 1949, has been used as the emblem of the State of Israel. 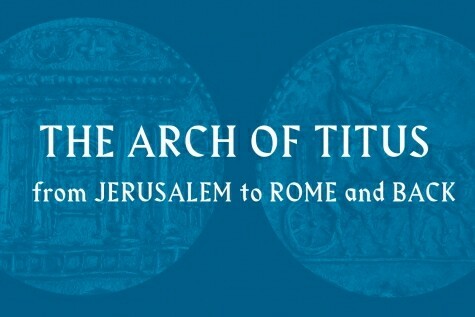 Stretching from the Roman era to the present, The Arch of Titus – from Jerusalem to Rome, and Back explores the image and symbolism of the Arch from various vantage points – from emperors and popes to Jews and Christians, who re-interpreted the meaning of the Arch in modern times. Rare artifacts from collections in Italy, Israel and the United States illuminate the monument’s vibrant history, as the Arch itself went from monumentalizing victory to falling into ruination and, eventually, to being restored in the modern era. An international conference presented in partnership with the Yeshiva University Center for Israel Studies will take place on October 29, 2017. The exhibition is complemented by The Rome Lab, a learning space dedicated to Roman Jews, to the formative centuries of Western Judaism and to the over 2000-year-old relationship between Rome and Jerusalem, co-presented by Centro Primo Levi and the Jewish Museum of Rome. “AN EXTRAORDINARY EXAMPLE OF A MIXED REALITY MUSEUM INSTALLATION. DONALD H. SANDERS, PHD, PRESIDENT, LEARNING SITES, INC. 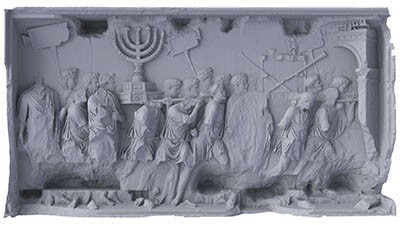 In 2012, a team of historians, scientists, and archaeologists began to study the Spoils Panel of the Arch of Titus, Rome using ultraviolet visual absorption spectrometry (a technique that uses white light and a spectrometer to measure the wavelengths of the reflected light from a surface) to investigate crevices in the relief. The measurements taken from the menorah corresponded to yellow ochre, confirming for the first time that the color of the menorah on the relief was meant to evoke the gold of the original taken from Jerusalem. Using ancient literary sources, evidence from Roman wall paintings, traces of color detected on other Roman sculptures, archaeological evidence, and scholarly intuition, colors could be defined for most of the other features of the panel, as well. This was just the beginning. For an exhibition on the arch at the Yeshiva University Museum (NYC), we were called upon to create a unique display as the centerpiece of the exhibit. Neathawk Designs (Williamstown MA, USA) milled an exact full-scale replica of the spoils panel using their CNC (Computer Numerical Control) machine. Our modelers, under the direction of Steven Fine (Yeshiva University, NYC) and Peter Schertz (Virginia Museum of Fine Arts, VA, USA) digitally restored all the missing objects, people, and clothing of the relief. That digital replica was then colorized and projected onto the replica of the current relief in the museum gallery providing visitors to the museum with a heretofore unimagined glimpse into the past and an image of the relief unseen for 2000 years. WILLIAMSTOWN — Donald Sanders, an architect/archaeologist in Williamstown, will hold an open house on Sunday to show the recreation of a marble panel from the Arch of Titus in Rome that has been created by his company, Learning Sites. The event will take place from 2 to 5 p.m. at Neathawk Designs, 610 North Hoosac Road. 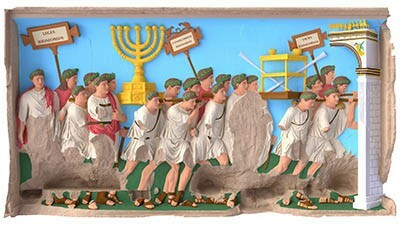 Arch of Titus Menorah Panel (reimagined with original colors) oil on carton board. 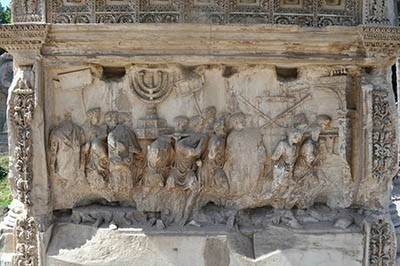 Now ironically in the news was another panel that was made that featured the menorrah being taken away from the Arch of Titus in Paris. The Art Conservation Department at the Israel Antiquities Authority were the ones in charge of this one and was given as a gift to the head of UNESCO Irina Bokova who will be stepping down in October of 2017. She was also part of the Arch of Triumph being set up around the world. This panel was given to her by Israel and will be featured in Paris. Another intruding thing to note is that the Arch of Triumph is also heading to Paris after today (9/30/17). Are these 2 pieces gong to the same place and in honor of Irina? To find out more about this connection to the Arch and Irina get my book. 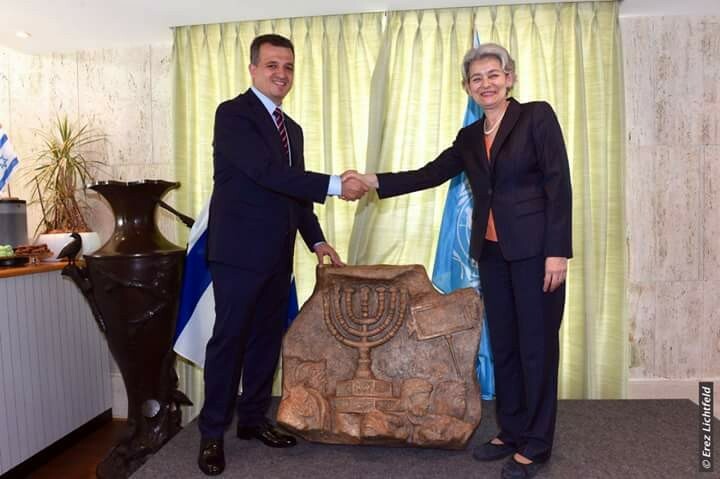 “Israel handed a replica of a frieze from the Arch of Titus to the head of UNESCO, using the monument commemorating Rome’s victory over Jerusalem for a not-so-subtle critique of the organization’s resolutions that ignore Jewish links to the holy city. The idea originally came from Prime Minister Benjamin Netanyahu, after the United Nations Educational and Scientific Organization passed a resolution last year that used only Muslim names for the Jerusalem Old City holy sites. 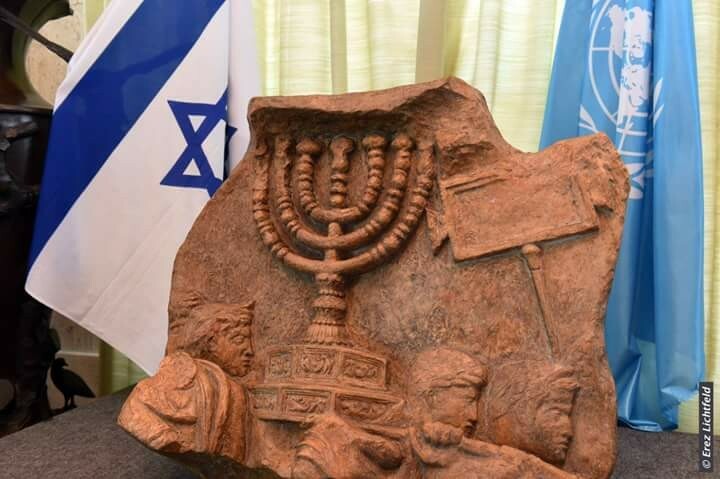 The replica will be exhibited in UNESCO’s Paris headquarters as a “greeting from the historical truth about the existence of two Temples on the Temple Mount,” said Carmel Shama-Hacohen, Israel’s ambassador to the agency. Liar Liar Arch on Fire!